So…shortly after our PARF season passes arrived, I found out that I was going to be a mommy. Then, I ordered the MA comfort patterns. 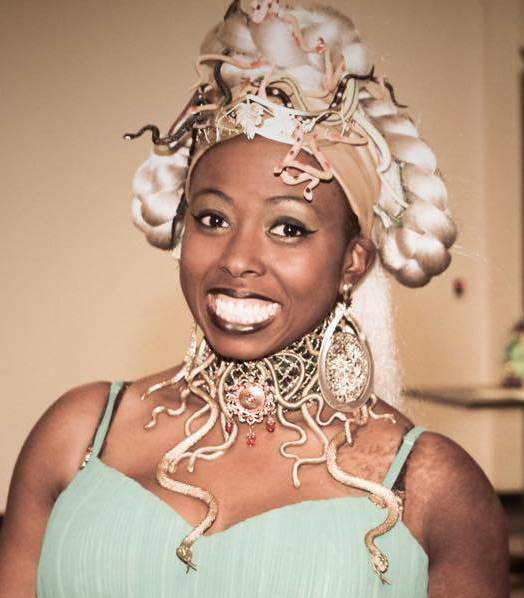 Originally, I was going to make one outfit to hold me over for the coming faire season. Yeah, right. After the first hot day of the spring, I realized that I was going to need something with less layers in addition to the kirtle and gown. I’ve made the low-necked version with the larger sleeves and a high necked version with lace on the sleeves and collar, so I was familiar with the pattern. 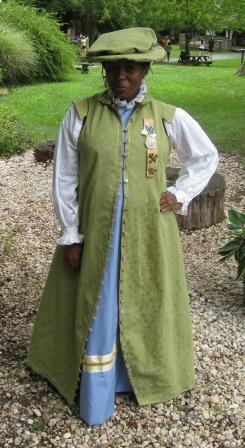 Aside from altering the kirtle neckline to square, I had planned to stick to the pattern. The gathering seems excessive in the back, but it fits with room for the expanding belly, at a size 16. I managed to put the sleeves on backwards–good job, me. I didn’t notice them until just before I got to the hemming stage, at which point it was way too late. I love the ruffles, and the crisp white makes me wish that I’d had time for blackwork. Oh, well. Years ago, I purchased heavy linen online in ten yard pieces in mulberry and yellow. I decided that the yellow was too bright for an outer layer, so I’ve been using it for interlining and other unseen bits. 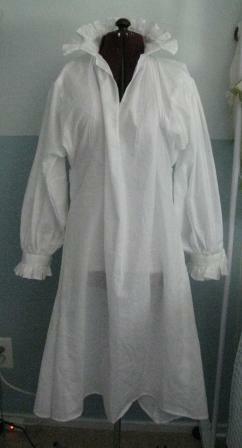 I had reserved the linen for my Tudor kirtle at my normal size, but that’s okay. The mulberry is low-key enough for a working class gown, in my opinion. Even though the Tudor waistline is a little higher than I’m used to, I needed to go higher for the belly–ending just below the sternum. I shortened the pattern by an inch and cut the boning an extra half inch short, just in case. The inner layers are both duck, though one is softer and lighter than the other. I used heavy duty cable ties for the boning and added six bones for extra support. The piping is made from the same remnant as the neckbands, but I did not cut it on the bias. I just ran it through the bias tape machine along the selvage and stitched it around macrame cording. The lining is muslin. I didn’t think that prewashing ten yards of heavy linen would hurt this project, since it’s just a good idea. However, after four washings and dryings, I found that I no longer had the ten yards of linen that I thought I had. Instead of cutting three front and sides with four back pieces, I ended up with three front and sides, one full back piece, and three partial back pieces. Despite the yardage and cutting issues, I stitched the skirt together without difficulty. I think the back panels are stitched out of order, but it doesn’t seem to make a difference at the moment. The pleating was easy enough, although, I should have reversed the way they’re laid so that they would open to the sides rather than the front. Oh, well. Once I stitched the bodice to the skirts [the first time], I decided to shorten the bodice. I folded the bottom an inch to the inside, pinned the pleats down further, and stitched again. I should have been smart enough to trim the seam, but I wasn’t thinking. Oh, well. I did the eyelets with embroidery floss a few shades lighter than the linen, and I decided not to do them the full way around. Each eyelet only has between six and ten stitches–they’re not pretty, but they’re sturdy. 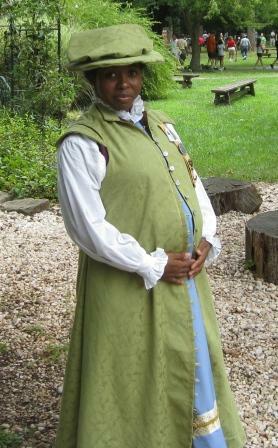 I tried on the kirtle, and found that the bodice falls perfectly above the current stage of pregnant belly. Yay, me! Just so that there’s no confusion, I hate hemming. Having S.A.R.A. makes life easier, but I still hate hemming. I need to find a sewing buddy who’ll mark my hems for me. I can handle the stitching part, obviously, but hemming a skirt/gown with 7 panels is not my idea of a good time, and I rarely care if it’s done right. Anyway…fitting and attaching the straps was easy enough, although my machine was not fond of the multiple layers. Everything fits as it should. 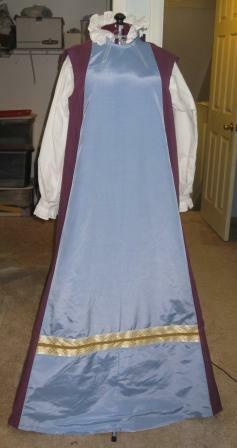 So, I originally wanted to use the blue fabric in my Tudor kirtle…the normal-me sized Tudor kirtle that is. I bought it to go with the green fabric that was going to become my first Tudor gown. It’s okay though, I’m not bitter. On to the matter at hand. 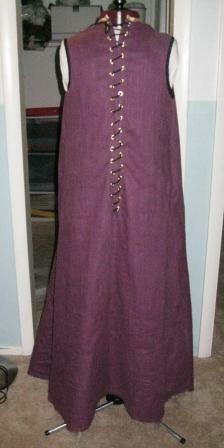 The hem is interlined with duck all around, and the kirtle front is flatlined with black twill. 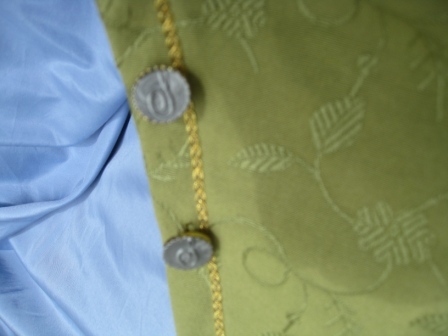 The sides and back of the kirtle are flatlined with a second later of foiled linen (foil sides together). I’ve never worked with or even heard of a linen/foil blend, and if I’d had to guess, what I picked up wasn’t what I would have imagined. However, it was in the red tag section and it felt light enough for my purposes. I bought it a few months back without an actual plan since it was only $2 – 3 per yard. I chose to keep the duck between the two layers rather than on the inside, which is done to hide the ridge. I wasn’t concerned with a ridge, but I was concerned with scratched up shins. I did a very simple trim on the kirtle front, layering gold satin ribbon under creme lattice ribbon and joining two of those bands with a strip of gold gimp. My original plan was to square the neckline of the front and bind it with more of the gold satin, but if it had turned out crooked, I would never have forgiven myself. 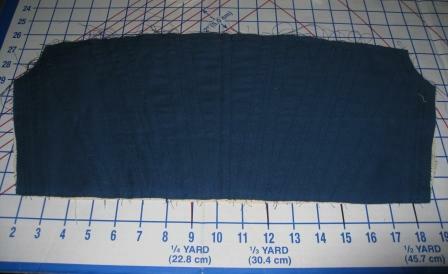 For the first time, I finished the seams as prescribed [*gasp*], using a zigzag stitch down the length of the seams. Boy, do I want a serger. *NOTE: I’ve started logging my construction times so that I can get an idea of what I’m putting into all of this costuming. For that reason, I’ve started doing things the right way, or, at least, the way that the instructions say I should. * I opted out of the breast feeding openings because I did. The neck is bound with gold satin ribbon, and the armholes are bound with black bias tape. I chose grommets over eyelets because there are 30+ lacing holes, and, well, I like my hands without cramps. I had to mix silver and gold grommets and secure a few with upholstery thread to avoid a trip to the store. Whatever, the kirtle won’t be worn by itself, so I’m not concerned. It is spiral laced with black macrame cording. As usual, I did not make sleeves, but that’s because I still want to use the rest of the blue fabric for my Tudor later. The kirtle is very comfortable and I don’t currently notice a difference between unfoiled and foiled linen. The neckline is a bit tight, so I laced it loose enough to function. 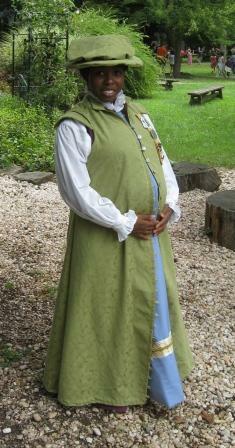 The fashion fabric for this gown was part of a 16 yard piece that I picked up last year to make a Tudor gown. It has very simple embroidered flora throughout. I flatlined with gray satin lining fabric because I had exactly enough on hand. Since a loose gown would allow me to conceal layers easier than a fitted gown, I didn’t have to worry about warmth, only drape. The fashion fabric already had the drape that I was looking for, so I knew the flatlining couldn’t be too heavy, despite the directions. I skipped the front slashes because I didn’t want any of the kirtle poking through, and I would have had to trim them. I had a couple rolls of metallic gold trim, about 1/8 inch in width, which I used for the button loops, front trim, neck trim, and shoulder wing trim. 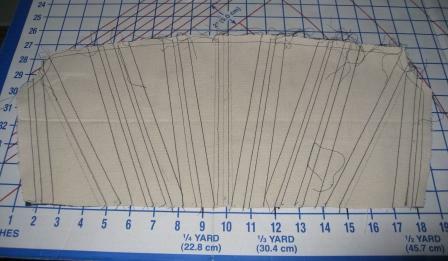 The gown is bound with brown bias tape (thank you rotary cutter and bias tape maker machines). When I make my next outer gown, I will certainly make the sleeves–I like a challenge, but this gown didn’t need anything that exciting. I had to take in the sides between the bust line and the gores by 2 inches, but that’s because I thought my belly would be bigger by now. I’m not complaining. The buttons (~30) were the last issue to figure out. Since I was able to make all of the kirtle and gown without a shopping trip, I wanted to keep the streak going. I did happen by the fabric store while shopping for a friend’s outfit, and I even picked up a bag of 10mm plastic pearls with the intention of making buttons. However, the pearls didn’t give the look I wanted, so I threw them in the “jewelcrafting” drawer and looked through my organized, never-lets-me-down bucket-o-buttons stash. I found about 35 of a shank style gold button blank that I’d used in previous projects. Unfortunately, they were too blank. I got the idea to paint them, but didn’t have plastic adhering paint. In the paint drawer, I did find silver wax and an “S” wax stamp. I bought the set for our wedding invitations last year, but never used them because the invitations weren’t fancy enough for all of that. I melted the wax into the buttons and stamped them all by hand. Next time, I’ll get the glue gun version of the wax; playing with an open flame and plastic is less than ideal. Here’s a fuzzy picture of the result. I LOVE this outer gown. It is extremely lightweight and comfortable. It has no frills and the color doesn’t require much commitment. I just love it! As you can see from the previous pictures, I have a green hat. That was a last minute addition, the night before faire, done completely by machine in about 40 minutes. Those of you familiar with hat making, or, at least, MA hat making, know that there is a fair amount of handsewing involved. I didn’t even bind the wire to the plastic canvas frame by hand. Well, I did, but not with thread…masking tape is an under used tool…. For anyone left reading this after that last bit, I’ll continue. I used leftover felt to pad the canvas and found out that plastic canvas can go in the sewing machine as long as you go slowly. Instead of pressing in the seam allowances on the fashion fabric and slipstitching the pieces together, I turned the brim inside out, stitched the outside, flipped it, and forced the base inside. My justification was easy: the hat is supposed to be bendy anyway. Once inside, I put the brim back into the machine and stitched the inside closed. I gathered the crown and stitched that to the inside. I did skip the binding step because I was really tired, but I plan on getting it in before the next wearing. I acknowledge that I took cheating to a whole new level on this piece, but at least I didn’t have a chance to use my glue gun…. Honey you look great! When are you due? Thanks! Our due date is October 6; she’ll be here before we know it!